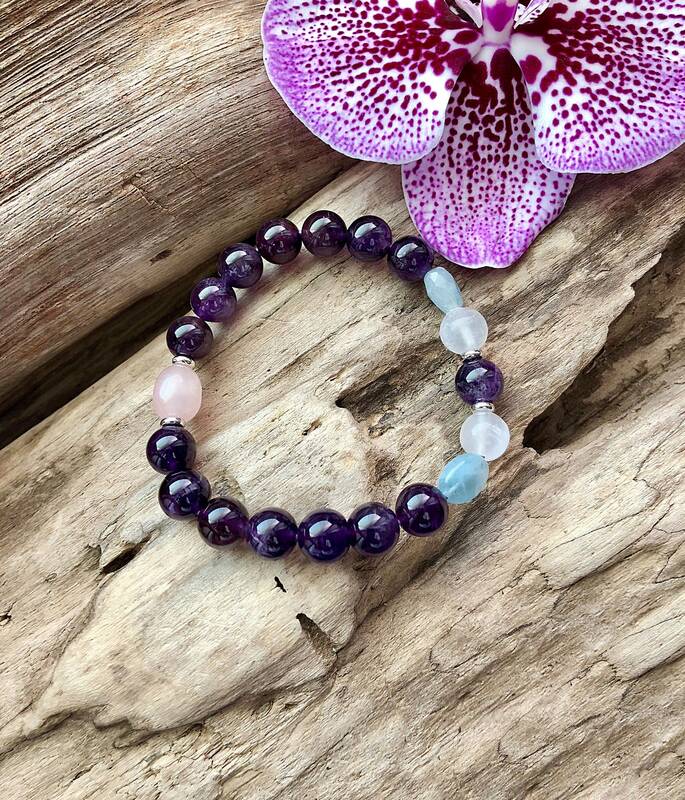 The Peaceful Sleep Mala Bracelet features luxurious AAA grade purple Amethyst gemstones along with Selenite, Rose Quartz and Aquamarine to soothe your mind, relax your body and give you a peaceful night’s rest. 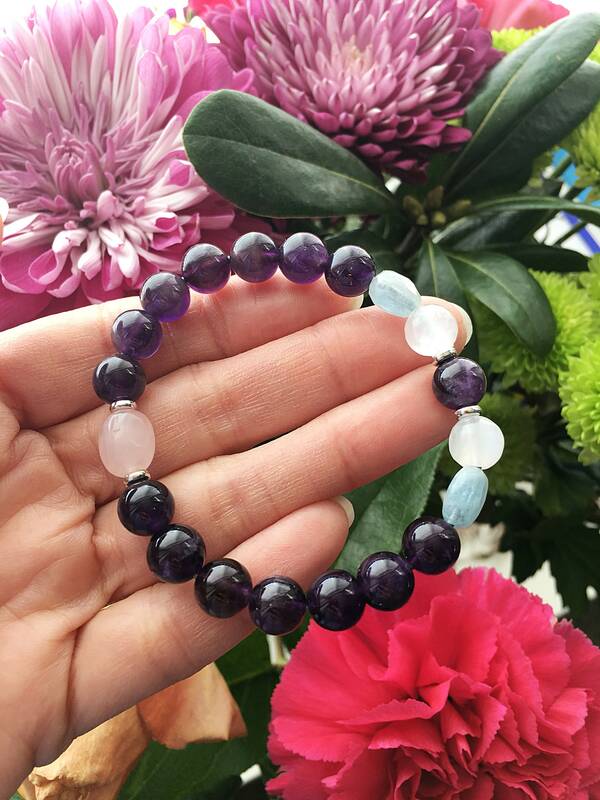 *This bracelet can also be worn to instill profound peace and relaxation during the day. Amethyst is helpful when insomnia is caused by overactive thoughts. It is extremely beneficial to the mind, calming or stimulating as appropriate. It will help you feel less scattered, more focused and in control of your thoughts. It balances out highs and lows, promoting emotional centering. Amethyst also dispels anger, fear and anxiety. These powerful gemstones can actually build a protective energy shield around the body to protect you from psychic and emotional attack, thus repelling negative energies and ridding the body of stress, anxiety, nervousness and even frustration about not being able to fall asleep. Many people also wear Amethyst to induce lucid dreaming or astral travel while sleeping. Aquamarine gently calms emotions and quiets a busy mind. It soothes fears of all kinds and helps you to release extraneous thoughts. It filters information reaching the brain and clarifies perception, sharpening the intellect and clearing up confusion. Aquamarine invokes higher states of consciousness and spiritual awareness. It invokes tolerance of others and gives support to people who are overwhelmed by responsibility. Rose Quartz is the stone of unconditional love and infinite peace. It is especially healing for the heart chakra, teaching the true essence of love. 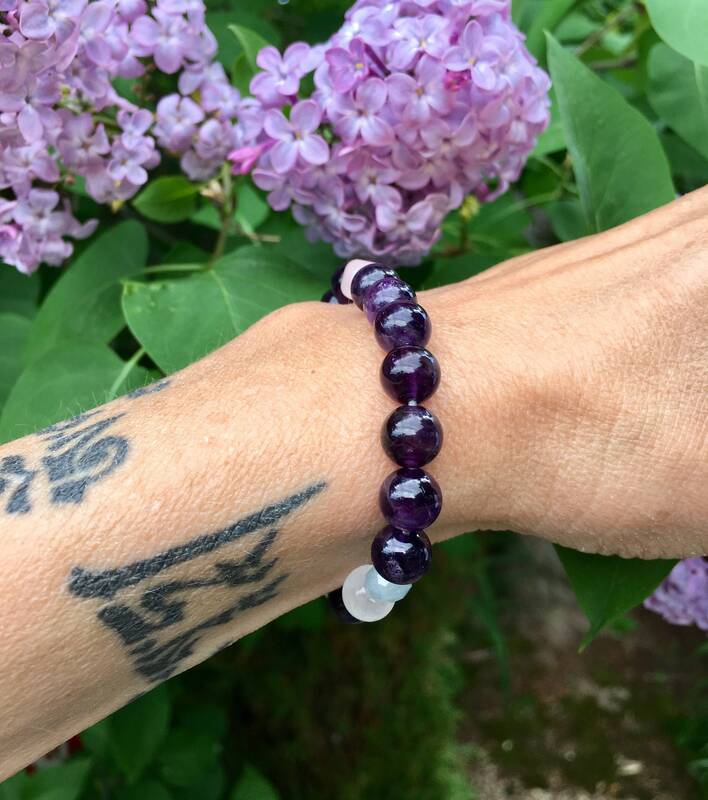 It purifies and opens the heart on all levels, bringing deep inner healing and self-love. Rose quartz draws off negative energy and replaces feelings of worry and anxiety with calmness and reassurance. If you have loved and lost, it comforts your grief. But most of all rose quartz teaches you how to love yourself, encouraging self forgiveness and self worth, necessary for peace of mind while trying to rest. Selenite has a very fine vibration that clarities the mind by opening the crown and higher chakras, and accessing angelic consciousness and higher guidance. It is an extremely calm stone that instills deep peace. Selenite has an ethereal quality and it is said to inhabit the space between light and matter. It surrounds the body with protective energy while you are sleeping, thus diffusing tension and allowing you to wake up restful and refreshed. *Selenite crystals do not like to get wet. They will turn cloudy and lose their healing vibration. We recommend not exposing this bracelet to water or liquid of any kind. 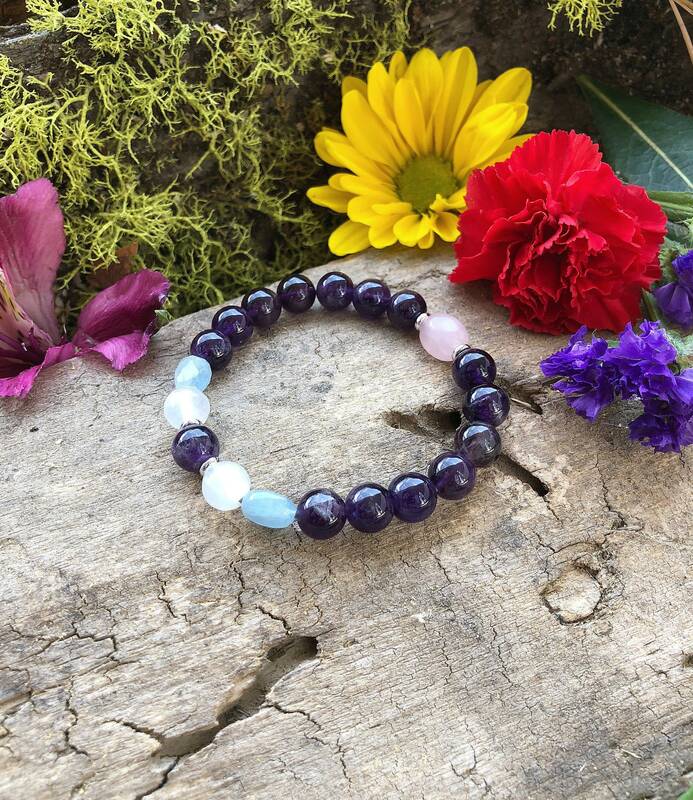 *To extend the wear of the Peaceful Sleep Bracelet we recommend wearing (or meditating with) it before bedtime and then carefully taking it off and setting it aside during the night while sleeping. 8mm natural gemstones, strung on strong elastic stretch cord. Custom sizing is available.